COMMUNITIES across the Outer Hebrides are waiting to welcome the world as the area embarks on a triple-pronged tourism promotion to raise the profile of this unique and exciting island chain as a desirable must-visit holiday destination. Using European and industry networking initiatives combined with a carefully crafted new online identity, the interconnected islands hope to pique the interest of audiences across the world and increase the number of visitors to the area. 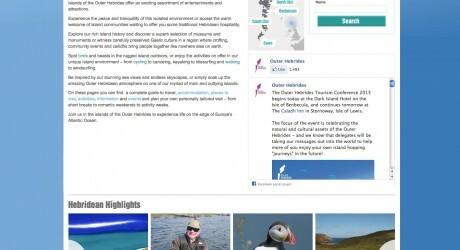 Following on from last year’s creation of a new brand to represent these rich and diverse islands, the Outer Hebrides Tourism Industry Association (OHTIA) today (Thursday 25th April) launched a new dedicated destination website for the archipelago – visitouterhebrides.co.uk – offering a uniquely useable combination of information, inspiration and trip-planning tools to interested travellers anywhere in the world. The website launch is being timed to coincide with the arrival of delegates from Europe and across the industry, who have been invited to experience these amazing islands for themselves and take part in the Outer Hebrides’ annual tourism conference. In the Year of Natural Scotland 2013, the Outer Hebrides will welcome representatives of a selection of European destinations, each of which shares an emphasis on environmental attractions. As part of an OHTIA LEADER Nature Tourism Project familiarisation visit this week the destination delegates took the opportunity to share their own experiences of attracting and enhancing nature-based tourism, as well as enjoying first-hand a range of Outer Hebridean attractions. From landing on the beach at Barra (an aviation experience consistently voted as one of the world’s best) to birdwatching at Harris’s eagle observatory to a taste of the islands with dinner at stylish Stornoway eatery, Digby Chick, the delegates were offered the chance to experience the essence of the islands, which will enable them to go out and become ambassadors for the Outer Hebrides in their own area. The Nature Tourism Project’s international members were then joined by domestic industry representatives at the annual OHTIA tourism conference – held in Benbecula yesterday Wednesday, 24th April and today in Stornoway – which this year focused on celebrating the natural and cultural assets of the Outer Hebrides as well as highlighting the importance of using the internet for tourism promotion. Key speakers included the chief executive of the Scottish Tourism Alliance Marc Crothall (who offered an insight into the islands’ place in the new national tourism strategy from Scotland) VisitScotland’s Riddell Graham (who offered advice on developing the tourism product and enhancing the visitor experience) and Shirley Spear from award-winning and internationally renowned island enterprise, The Three Chimneys (who helped highlight the power of fresh local produce in enticing visitors and creating unforgettable experiences). Delegates were introduced to the new online identity by representatives of media company New Mind – designers of the new website which aims to attract more interest in the islands online. OHTIA’s Ian Fordham said: “We are dedicated to raising the profile of the Outer Hebrides as a desirable destination for holidaymakers from across the world – and we believe the key to this is to help more people discover the delights of our islands. The Outer Hebrides Tourism Industry Association was formed in April 2005 to represent the industry with the aim and objective of promoting, supporting and assisting tourism businesses and interests in the Outer Hebrides. The Association’s Executive forms part of the Area Tourism Partnership group which agrees, reviews and monitors the implementation of the Area Tourism Partnership Plan. The purpose of the Plan is to maximise the benefits of tourism for the people of the Outer Hebrides, by developing a competitive industry, focused on quality and customer service that is economically, socially and environmentally sustainable and that builds on its history, culture, environment and hospitality of its people. Brand Proposition: Situated on Europe’s Atlantic edge, the Outer Hebrides is a unique and diverse chain of inter-connected islands with their own unique way of life, offering a vibrant activity, food, music, art, craft and Gaelic culture. Set in an outstanding and diverse natural environment rich with wildlife and heritage, the Outer Hebrides comprise a very special chain of islands; ideal both for those who are seeking peace and tranquillity and also those looking for active adventure with a taste for a different way of life. MEDIA RELEASE posted by theKeithConsultancy. You too can post media releases (aka press releases) on allmediascotland.com. For more information, email here.